Can James grab book chart crown from King? A CRIME author is hoping to bag another number one as he battles it out with a legendary horror writer at the top of the bestseller book charts. 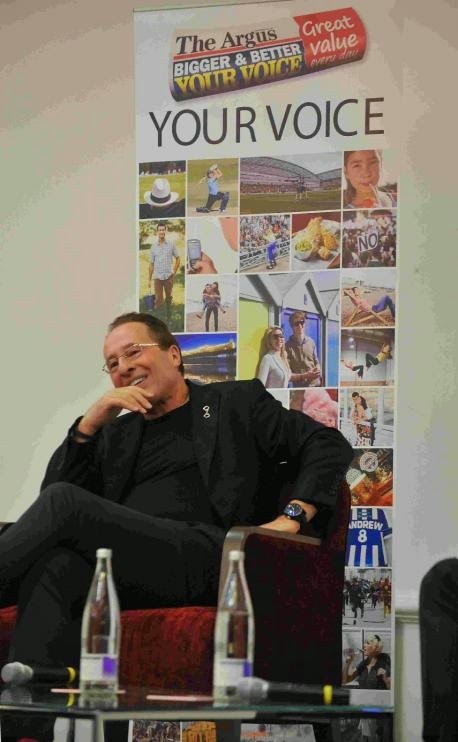 Peter James has been meeting his fans in Sussex this week to mark the release of his tenth Roy Grace novel, Want You Dead. Early sales figures put the Brighton-born author marginally ahead of The Shining author Stephen King, but the winner won’t be announced until next week. On Tuesday night, The Argus’ editor Michael Beard hosted a special question and answer session with Mr James to discuss his latest book in front of an audience of Argus readers. The author has been thrilling crowds with book signings across the county, which are set to continue at Ropetackle Arts Centre in Shoreham on Monday. Mr James said fans had travelled from as far afield as York 270 miles away to see him at the book signing and that he took great inspiration from speaking to fans and meeting professionals who could assist him researching future books. He added: “It was great fun, I really enjoyed the evening and Michael threw some interesting questions and I had some good ones from the crowd.